It would have been preferable to have had a single production facility for all the new farmable aquatic additions to the game, as I'd originally planned, but in the end, I had to go with two. Subacuatic Acuarium, close to the base and in an area of bare-floored ocean, has already produced two tridents (and as many more as I will ever need, albeit very slowly) and a large amount of kelp. So I still needed to produce sea grass, sea pickles and scutes, and even in the snapshots, all the usual suspects on YouTube had started making their own farm designs. Scutes could only be produced in Beach biomes, seeing as they are a byproduct of breeding turtles, but the others could be farmed anywhere. 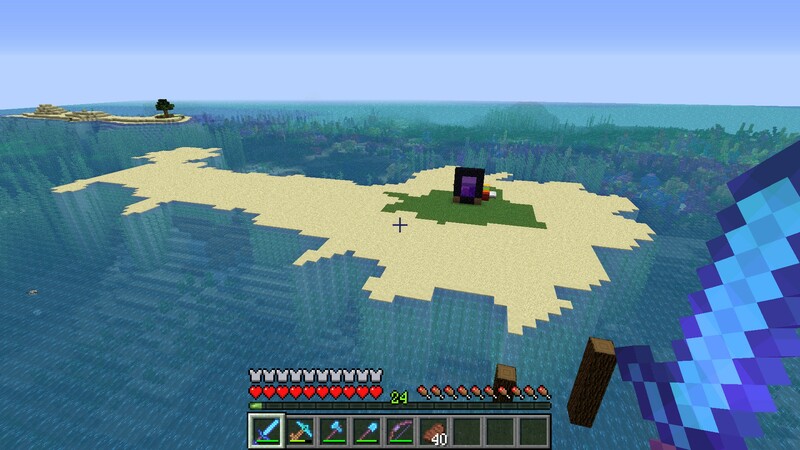 However, 1.13.1 threw up an interesting addition - the ability to grow coral as well as sea grass by scattering bone meal on the ground in a Warm Ocean biome. Clearly, it would be an advantage to build any sea grass farm in the Warm Ocean - the downside was, building a trident farm in the same place would mean clearing all the vegetation and the coral reefs from the ocean floor. I am no environmentalist, but coral reefs are rare enough that this was not acceptable, and swung the decision to build Subacuatic Acuarium in the nearby 1.8-generated ocean, with this Subacuatic Outpost in a newly-generated Warm Ocean much further away. An Australian YouTuber who I hadn't previously heard of, stormfrenzy, provided the designs for both the sea pickle and sea grass farms - the latter of which, if built in a Warm Ocean biome, allows the production of all the types of coral and coral fans as well as sea grass; they just have to be harvested differently. 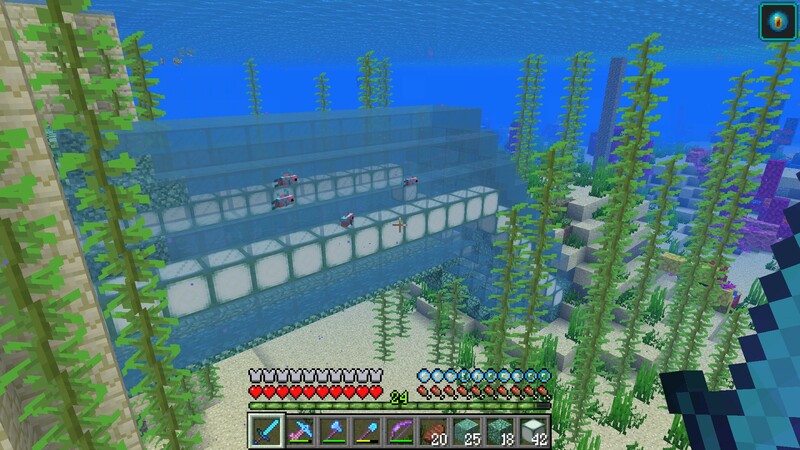 I'd been planning to build xisumavoid's sea pickle farm originally, which would fit neatly into the space under sea level at Subacuatic Acuarium, but found stormfrenzy's to be far more efficient in a test world - not to mention that it's automatic, fill it up with bone meal and no further player input is required. It's a picturesque location I've found for this build - although it'll soon be transformed. 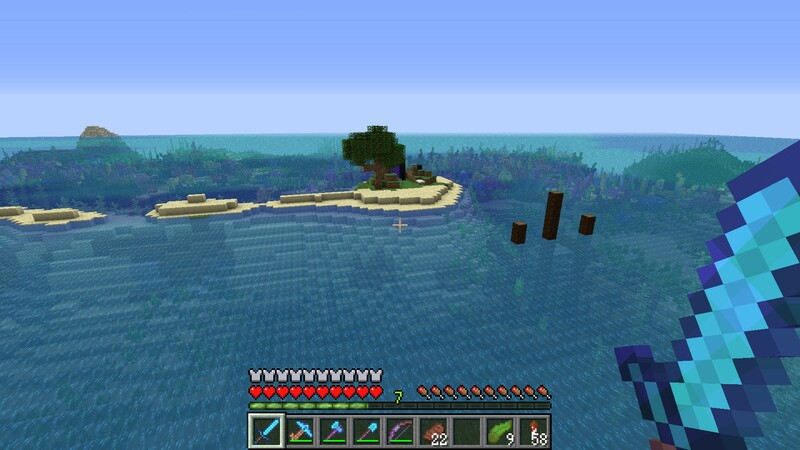 There's a shipwreck (which I've raided and found very little of interest), this small island and some sand banks, and a coral reef in the distance. Although there's also a visible ocean monument, it's too far away for the guardians to be causing me any trouble - though I might raid it at some stage and see if it has any extra sponge. You can never have too much sponge. 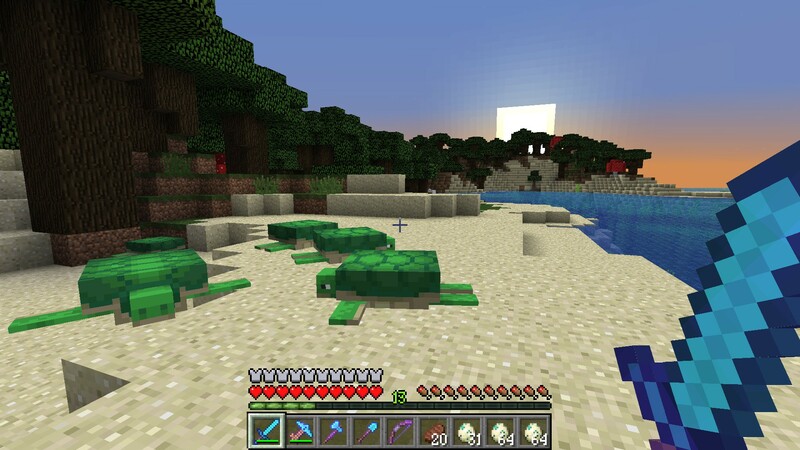 Before I can do anything of any note, I'll need to obtain some turtle eggs. For the initial forays in 1.13 during Project 55: Healing The Sick And Burying The Dead, I'd found this beach further west than the Subacuatic Outpost site that had eight turtles on it, so I could obtain my first few scutes to make Turtle Master potions with and fill in a new filter during the base expansion. Here, it's not the scutes I need, it's the eggs, which can be picked up with any Silk Touch tool, such as the Hammer of Misfortune. 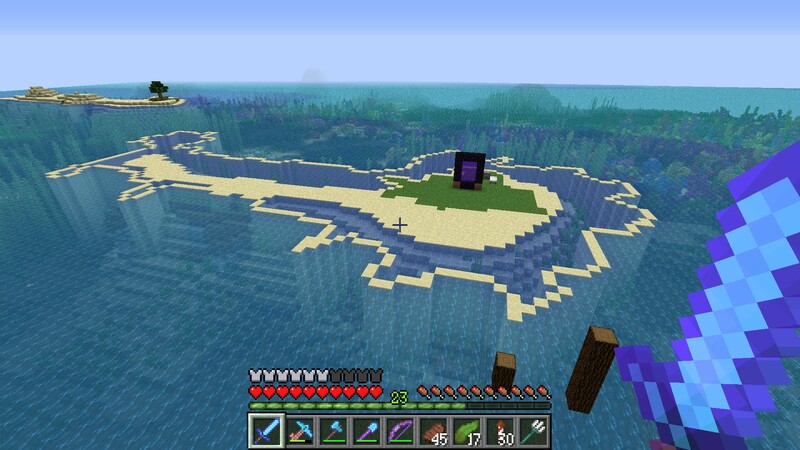 To maximise the space I have for this project, I've marked the outline of the Beach biome around the island, and flattened the terrain to sea level. Anything outside the sandstone wall is ocean of some variety, and any grass is the Forest biome at the centre of the island, which is useless for turtle breeding. Fill the outline with rubble (three chests of mixed igneous rocks were ideal), top it off with sand, and I've got as much beach as I'll need. The kelp growing all around the underwater walls is just for decoration. I'm building the turtle breeding grounds inside a hemisperical dome. To maximise the radius of the circle at the base, I made a 1:1 maximum-zoom map of the area, reproduced it in GIMP with one pixel per block, and then found the largest sphere in Plotz that would enclose the maximum amount of Beach biome without including any ocean inside it - i.e. the walls of the dome could spill over into the ocean, but the area inside it couldn't. Taking a slice through the sphere and plotting the exact middle section on the GIMP map, this told me the maximum sized sphere I could build was 33 blocks (and the circle on the Plotz sphere isn't always exactly the same shape as a circle of similar diameter, due to the way they're calculated). The dome is built, and properly lit inside and out. There's a lot of cyan glass that has gone into this, and in the end there'll be far more than was used at Subacuatic Acuarium. 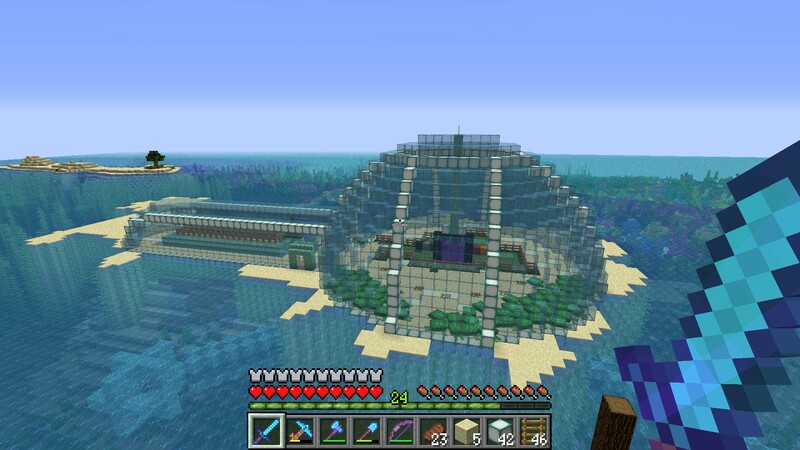 Inside the dome, I've fenced off the Forest biome, which isn't relevant to the turtles, and there's glowstone under the leaves. 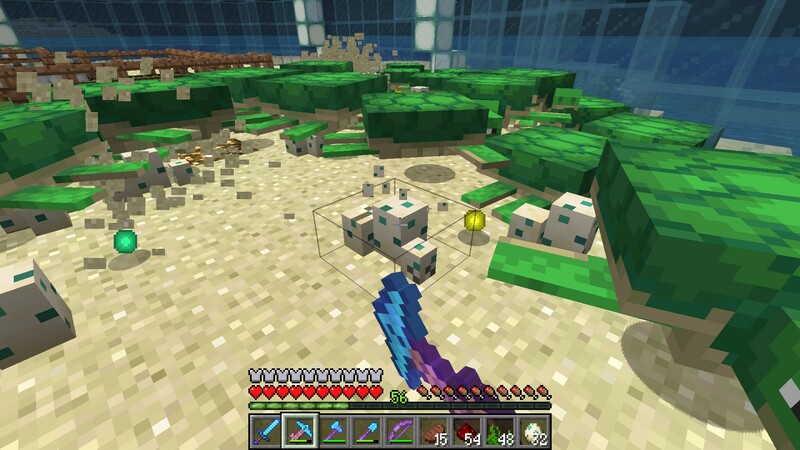 Only a few sand blocks had to be sacrificed to ensure no zombies spawn inside the dome and jump on the turtle eggs. The first turtles to hatch from the eggs have grown up, and as a bonus, have left a scute or two behind. Some more baby turtles are shuffling around as well, desperate to find the water they'll never get to. Once they've all grown up, I'll have 64 turtles to breed with, whose eggs I will manually harvest with the Hammer of Misfortune. As the turtles are available to breed again as soon as they've laid their eggs, rather than having the 5-minute timeout, I can get a large number of eggs in a relatively short time. So begins the build of Rays Works' turtle farm. Ray doesn't actually give a tutorial in his video, but he flies around in Spectator mode showing how it works, needing to look inside the structure to do so. From here, I could piece together how best to build it, having already tested it in a new Creative world with the same seed. Mainly, that was to see what the maximum size was that I could build it, but although Ray says it's expandable, I found it's not totally practical to do so. Anyway, at this point, this is all the redstone that's required to unload the minecart that hoovers up the scutes and sends them into the bubble column. This was a tricky build to show in progress... so I haven't; watch Ray's video if you're curious. I've built everything that's needed to make this farm semi-automatic - i.e. "hold down the right mouse button, and ride the minecart while pointing at the turtles". 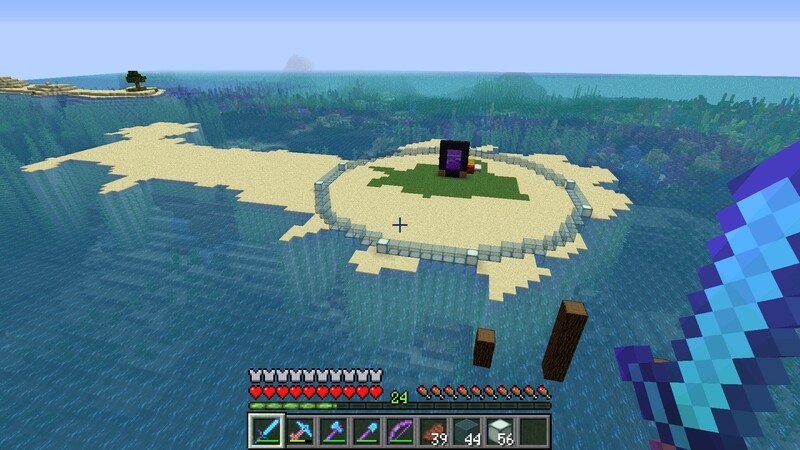 However, I won't be using it this way; instead, this will be a hatchery, where the 16 sand blocks (all of which must be in the Beach biome, and are) can accommodate 64 turtle eggs that I can take from the dome and deposit here. 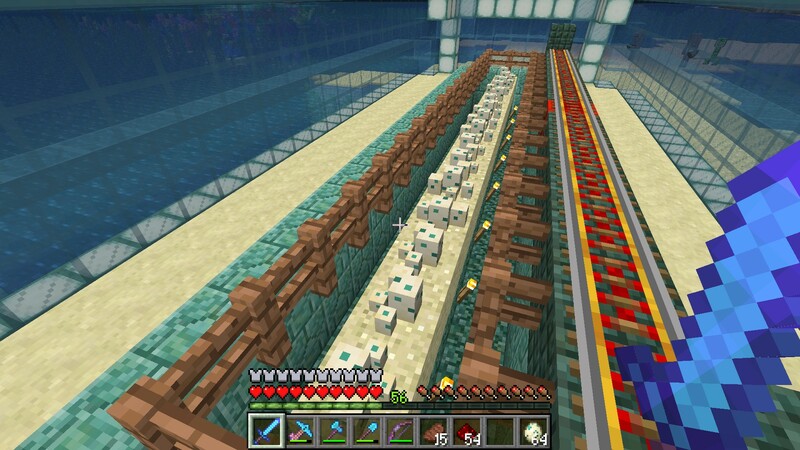 When the eggs hatch, the baby turtles will (hopefully) crawl over the edge into the trench (and I can give them a bit of "encouragement" if they don't); when they grow up, they suffocate in the prismarine brick wall, and the scutes that they drop are hoovered up by a hopper minecart running underneath. 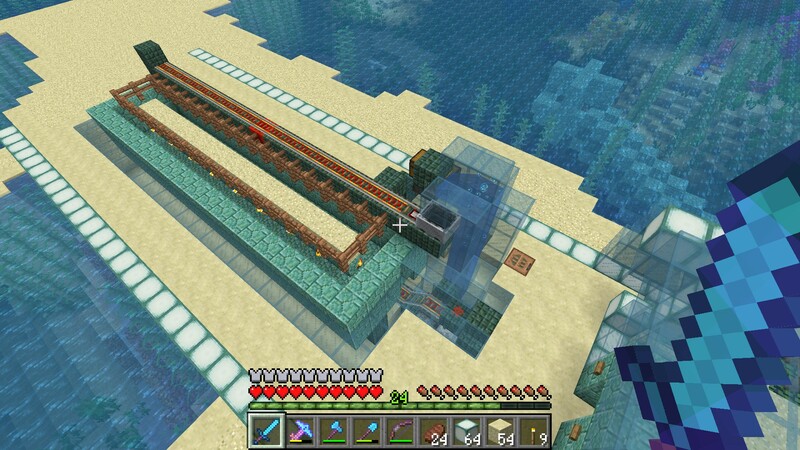 The scutes (and sea grass from the dead adult turtles) are dropped into the bubble column - and are held on top of the hopper until the minecart rides over the detector rail, or at least that's the idea; the player in the cart picks them up manually. I found it didn't work so well, as once the first batch of sea grass is exhausted, the player's inventory slot can instead be taken up with scutes, ruining the whole automation of the farm. What I've done is (and you can't see it here) taken out the redstone torch that locks the hopper, so anything that's dropped into the bubble column will be picked up by the hopper as normal and stored in the chest. 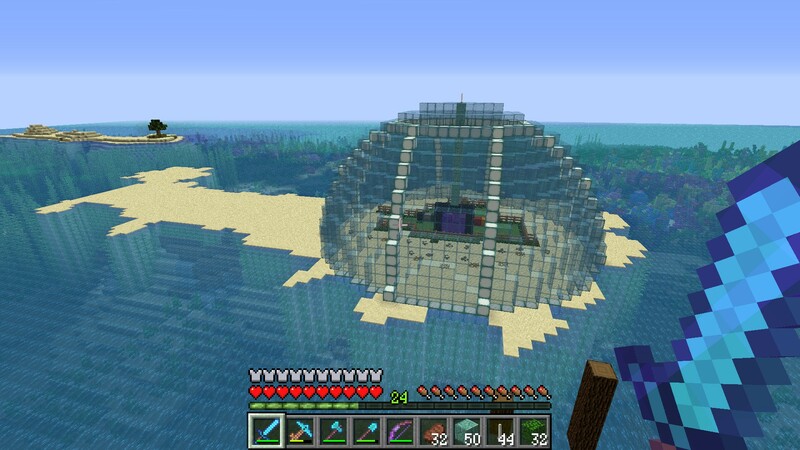 Phase 1 of the build is complete, with the matching glass cover over the hatchery that keeps the zombies at bay. I should now be able to get hold of scutes far more easily than by breeding turtles in the wild. 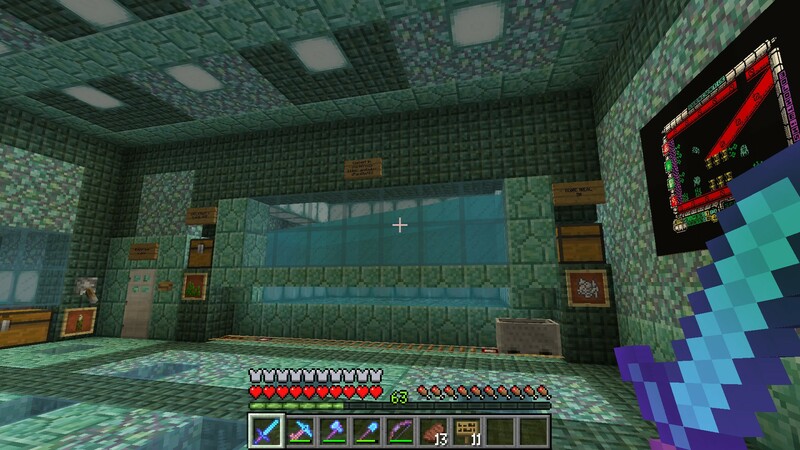 What's more, I haven't wasted the conduits that were going to be part of Subacuatic Acuarium; you can see one under the surface, linked to Turtle Island by a huge prismarine arm. There are four of these forming a huge X-shape that's just about visible on a map, providing some much-needed extra power when I'm in the sea. ...some calculations, a lot of cyan glass, marine blocks and sponge later, and I have a delivery tube that dives straight into an outcrop of sand and rock. What could be down there that's so interesting, I hear you all scream? The temporary gravel column is a marker for it. Also, I have Conduit Power. Underwater Breathing, Haste, and protection from wandering drowned zombies? I'll take that. This is what lies at the bottom of that gravel column, something I'd scouted out in a test world. 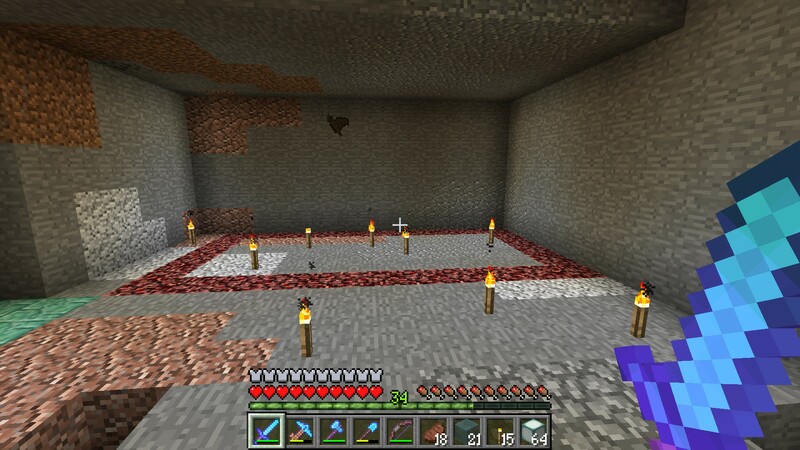 The location of this farm was chosen primarily because of this dungeon with a skeleton spawner in it, which is about to come in very useful. 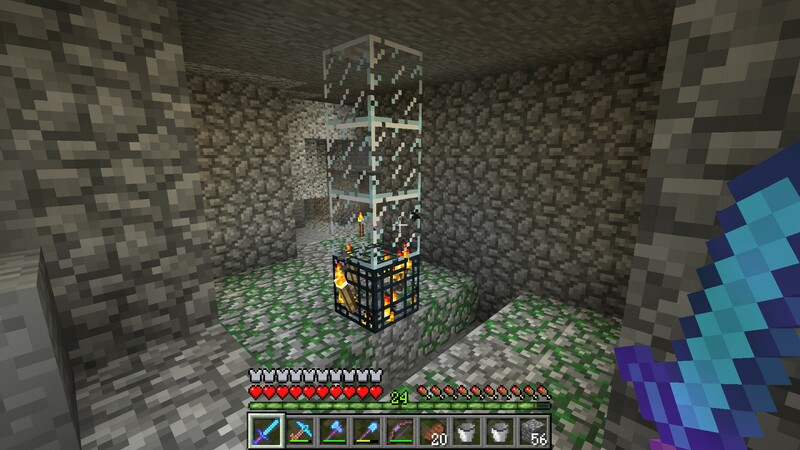 Way, way back in April 2012 (which was version 1.2), Paul Soares Jr. built a zombie spawner trap in his Survive and Thrive series. It's the one I referred to when building my first such trap in Rejectland (which was the first time I'd attempted automation of any kind - and which I can still refer to, to this day, to get the dimensions of the cell correct, which I have. 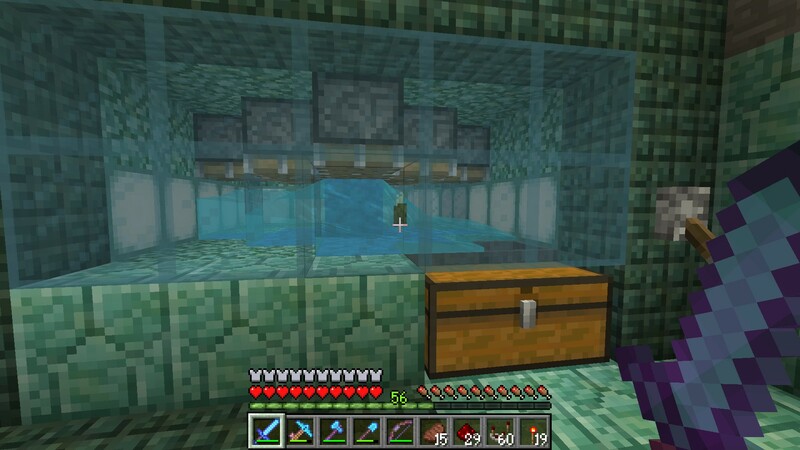 Paul's six-and-a-half-year-old design has the killing area below the spawner so the zombies are delivered by gravity, which is all very well - and other than the automatic drowning trap (which no longer reduces the zombies to piles of rotten flesh) this design would still be good in 1.13. 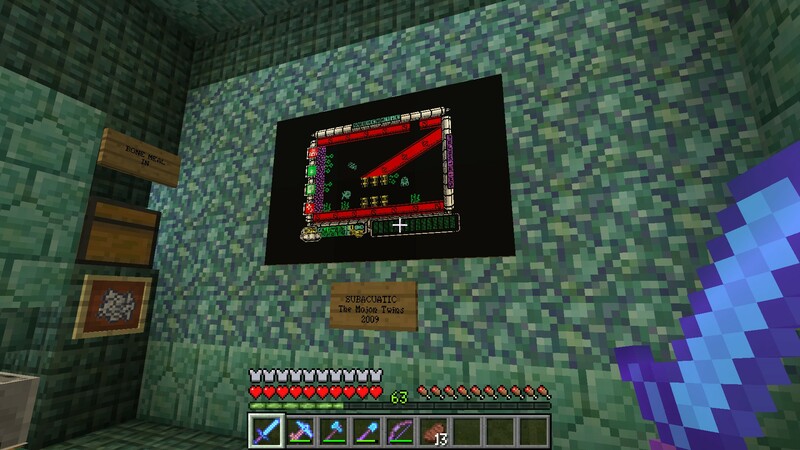 However, after seeing Dataless822's skeleton spawner XP farm in November 2013, this was the kind of design I always preferred from that point on - standing nine blocks directly above the spawner, which Data said was the optimal position for maximum spawning efficiency. 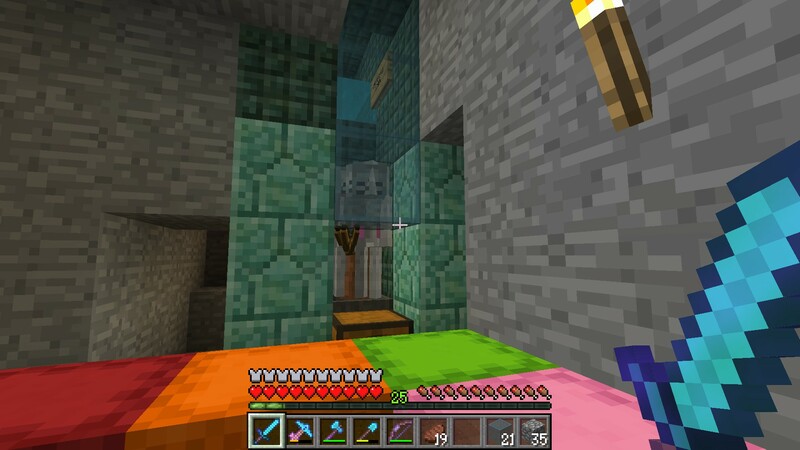 That meant the skeletons had to be transported up a water column - in 1.13, they need some encouragement to do so, with a water column made of water source blocks and soul sand at the bottom. 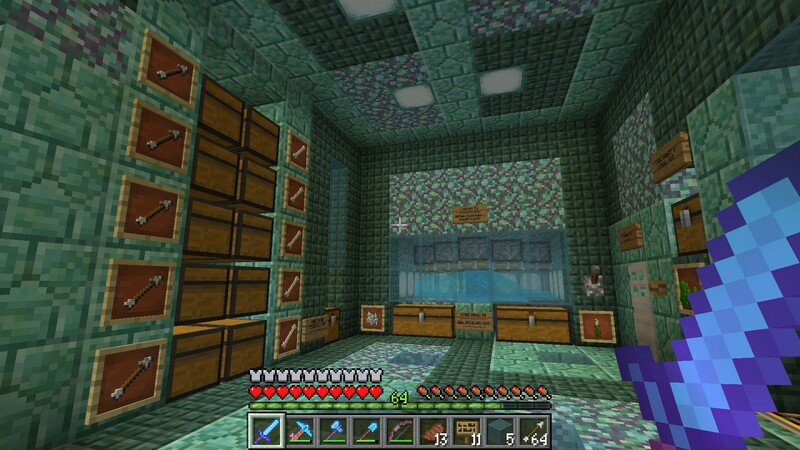 So I took Paul's spawning cell design, measured exactly nine blocks above the spawner as Data said, and took that as the floor for the second room of Subacuatic Outpost. 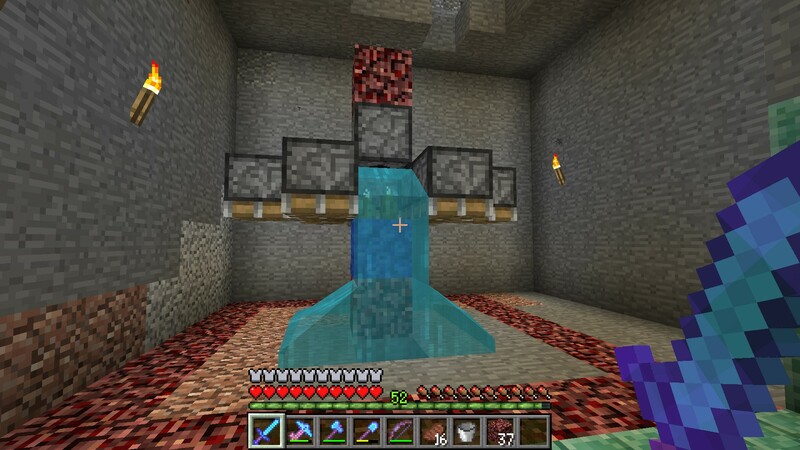 The way I have to build it to include the soul sand bubble column, there has to be a "dead" block between that and the stream out of the spawning cell, with a sign separating the two. Even putting the ultra-slippery blue ice in the floor of the "dead" block, the skeletons don't slide over it and one or two of them can remain there. However, as more skeletons spawn, those stuck on the blue ice block will be forced into the bubble column, where they'll go zipping upwards to be dropped into the killing cell... right here in front of me. And it's working absolutely fine, as you can see. What this gets me is a steady (and free) supply of bones, because the farms in this phase are both going to need bone meal. 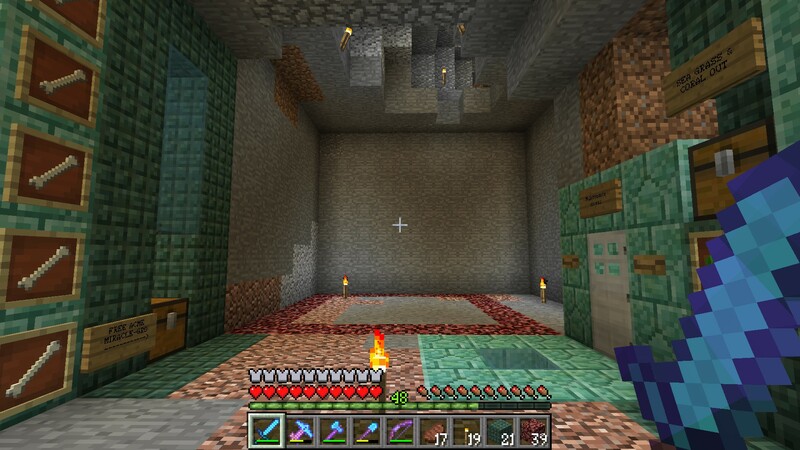 With that done, I can start digging out the holes in the wall that the farms will slot into. Directly in front of the entrance, 11 × 6 blocks is enough to install the sea grass farm. There' no need to show the build in this one - stormfrenzy will explain everything. All I had to make was a few tweaks regarding the bone meal input and the sea grass and coral output, but there's nothing major there. Originally, I'd considered building the farm with a sand floor, but as the only Silk Touch tool I have with me is Starquake, all I'd do with that is dig up the sand. Solid prismarine blocks it is, then. The sea pickle farm is worth a little more detail; it fits into this 7 × 7 space, and the walls of the farm will hide the redstone. 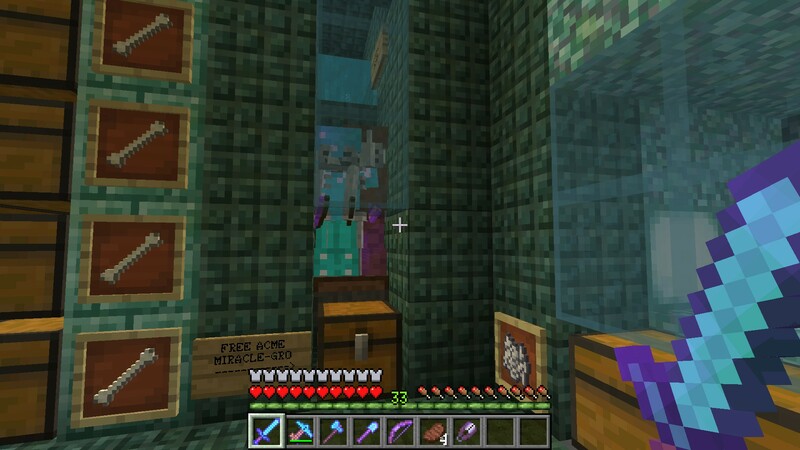 I've done a hint of decorating at this point; the glass block in front of the maintenance door is directly above the skeleton spawner do I can look in and see it's still working; the skeletons drop into a chute on the left where I can smash them with my Looting sword and store the bones just to the left. As for the sea grass farm, stormfrenzy explains everything, so you could just watch that video. I've placed my first coral block, and it hasn't died, so I must be doing it right - I've put the first few sea pickles on it, and from these, all the others will be cloned. 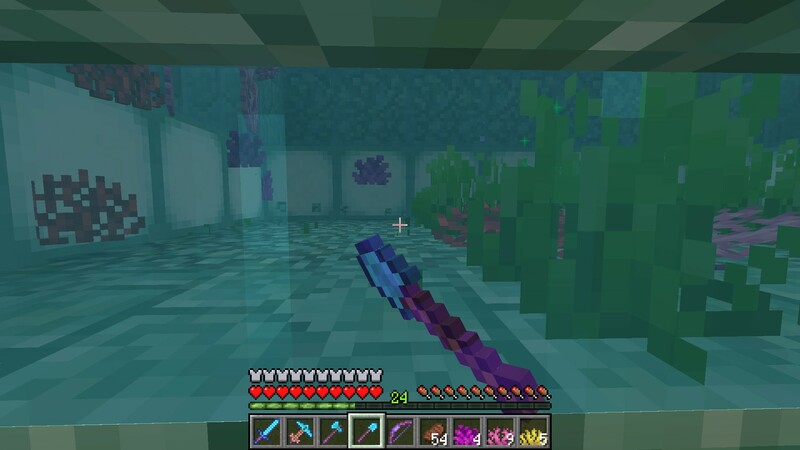 Only one coral block is needed for xisumavoid's farm, whereas this one needs 13, but if I'm going to travel all the way to a Warm Ocean (that isn't this one) just to get coral blocks, I may as well harvest a handful. 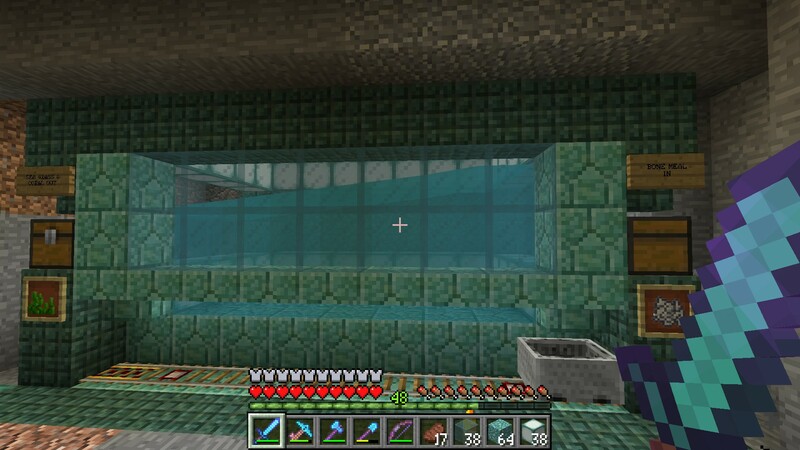 Five coral blocks are in, all kept alive by a single water source underneath the first one. 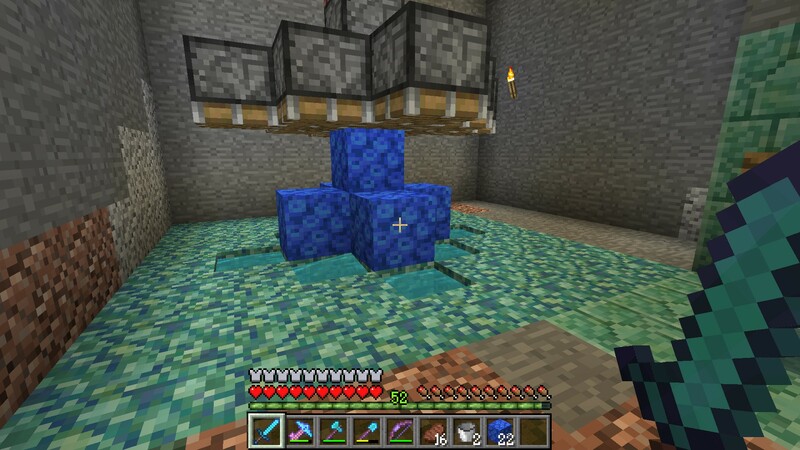 There's more water in place for the last eight blocks - and though water doesn't quite reach the level of the prismarine floor (and hence isn't in contact with anything above it), this is still enough to keep the rest of the coral alive. 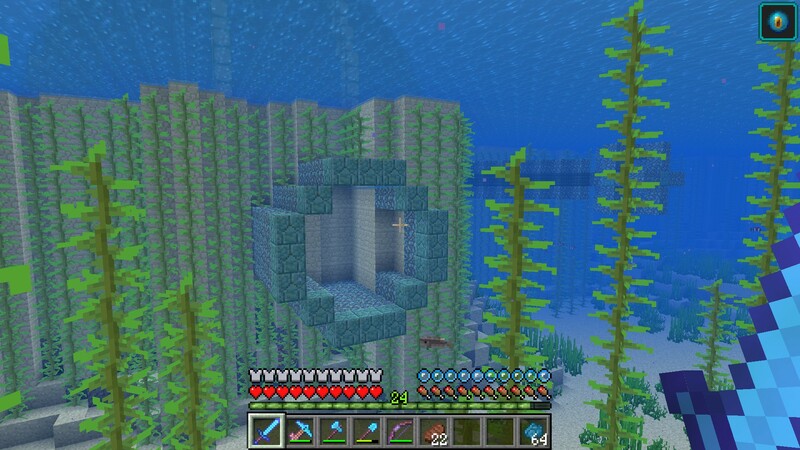 Of course, I've used blue tube coral because it matches the prismarine closer than any of the others, but any coral will work here. ...which needs to be lifted onto the top of the farm via another soul sand bubble column. 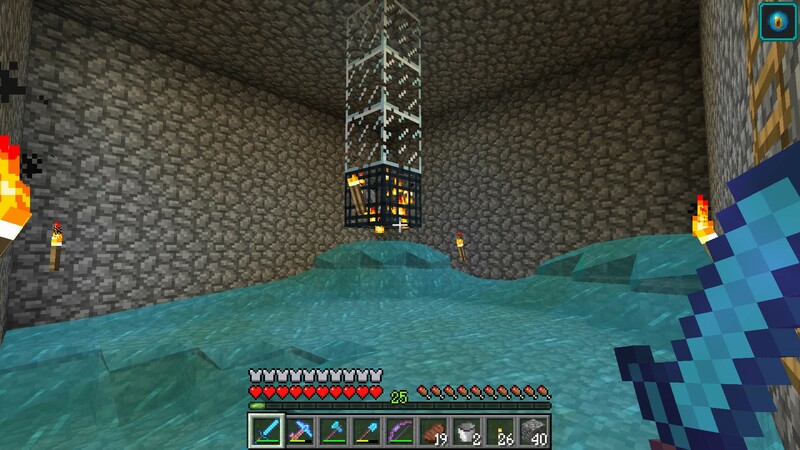 I had to be very careful when digging underneath the farm - the drips coming through the prismarine blocks aren't a problem but the last thing I needed was to burst one of the water tanks that was keeping the coral alive, because I wouldn't want it to die and I don't have a lot to replace it with. 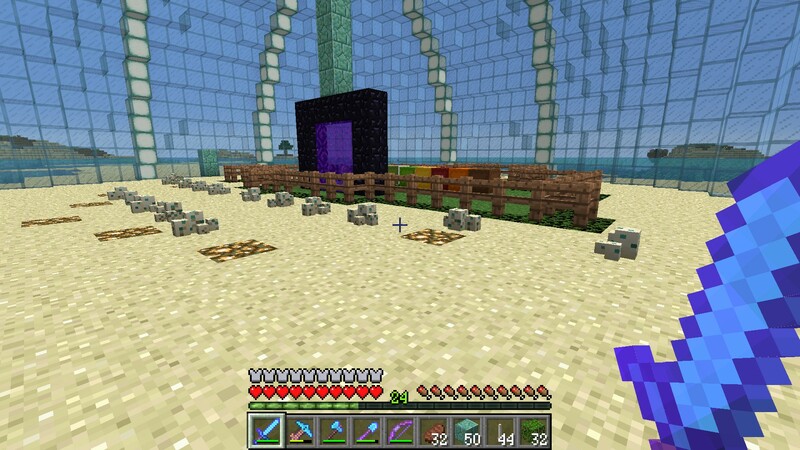 With no accidents of that kind, the sea pickle farm was complete and could be loaded with bone meal from the front. Just a final bit of decoration to do, now - and I thought I'd start with a screenshot from Subacuatic, given that I didn't have space to build another of the huge bank of faces from the game as I had in Subacuatic Acuarium. 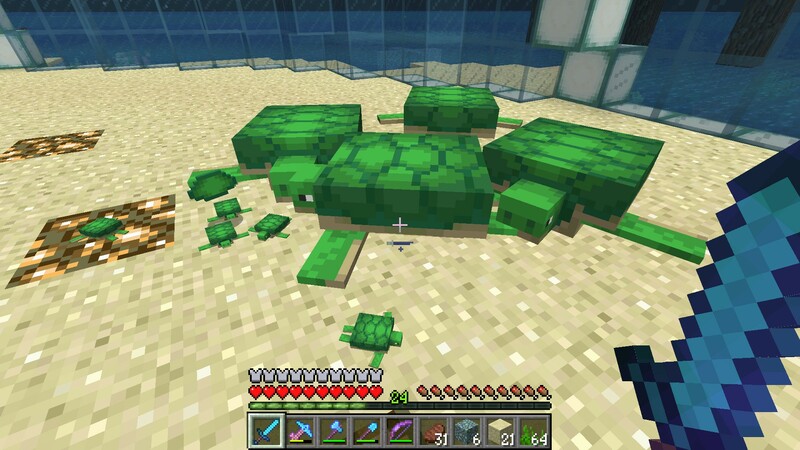 I suppose I could have surrounded the turtle breeding area with those faces if I'd built the trident farm in this area, but it'd have enclosed less space than the dome - and the drowned zombies might have made a beeline for the turtle eggs instead of the villager underneath the waves, so I wouldn't get any tridents. We can't be having that. Check the Subacuatic Acuarium project for more information on the game. Decorating the rest of this facility was a bit of a pain, as I'd planned the whole room around the window to the skeleton spawner being right in the corner - and not, as I should have thought of in advance, lining up with some much-needed floor lighting. 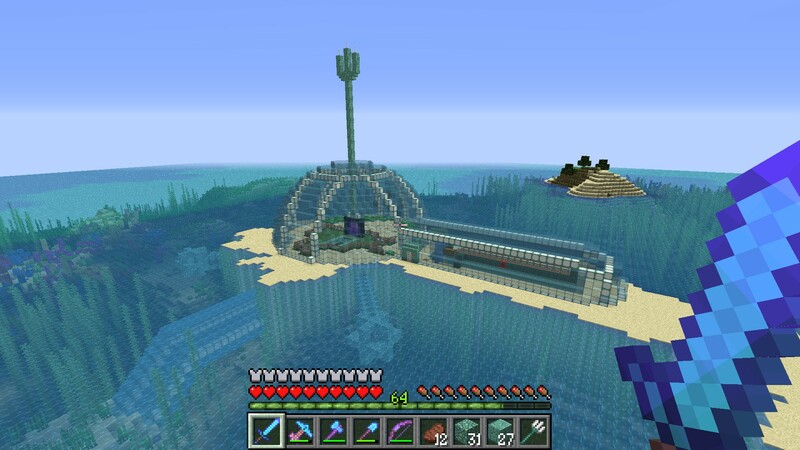 Either way, everything is a symphony of the three varieties of prismarine, as you'd expect from an ocean-based build. 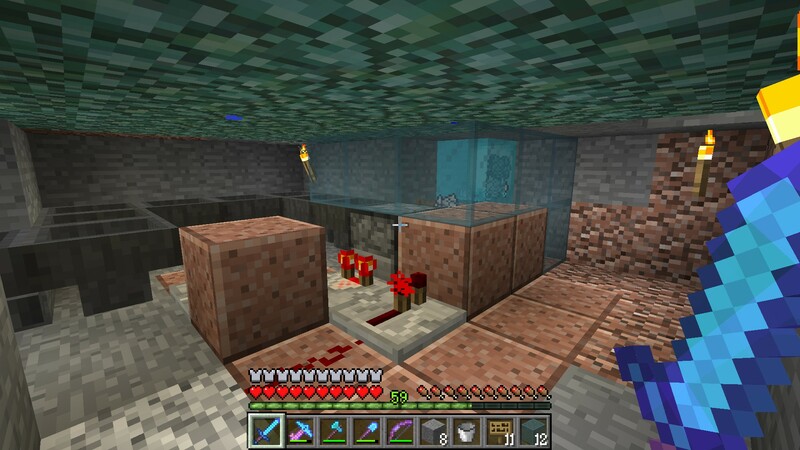 Meanwhile, all the redstone and machinery on top of the sea pickle farm is covered, and everything is accessible from the maintenance door, except for the skeleton spawning cell where I don't want to be anyway. I've allowed plenty of storage space for the arrows and bones that are produced - and I needed it, two of the double-chests of each were already full by the time I'd finished and a third was well on its way. And that's to say nothing of all the armour, and the bows (that I took back to the base and turned into dispensers... a lot of dispensers). First I'll test the hatchery, to make sure everything's working... now that I have the means of producing enormous amounts of sea grass. Even a quick test run with a single stack of bone meal produced enough to make the turtles go mad with lust for one another, and eggs were poppping up all over the place. That's a good thing, because it doesn't just have to be players or zombies walking on them that gets rid of them; another egg, another falling object, even an experience orb landing on the cluster of eggs can cause one to smash. That, and using the wrong hammer to harvest them with... fortunately, I have the right one. All I have to do is place a full stack of eggs in the hatchery (in 16 clusters of four eggs each) and wait. Occasionally, it helps to check that the hatched baby turtles are falling into the trench, because they don't always do it, but a bucket of water in the right place, or a whack with something that isn't a Sharpness V sword will do the trick. I never quite manage to get a full stack of scutes, but how many of them am I going to need, all things considered? I just wanted to make them easier to obtain. Skeletons do often spawn with gold, leather or chainmail armour, most of which I can loot. Sometimes, they'll have iron armour. But very, very rarely, one will spawn with diamond armour. Such as this one - this must once have been the corpse of Blackbeard the Pirate who looted so much from the Seven Seas that he bought this shining set of armour with all those pillaged gold doubloons. I managed to nick his trousers. 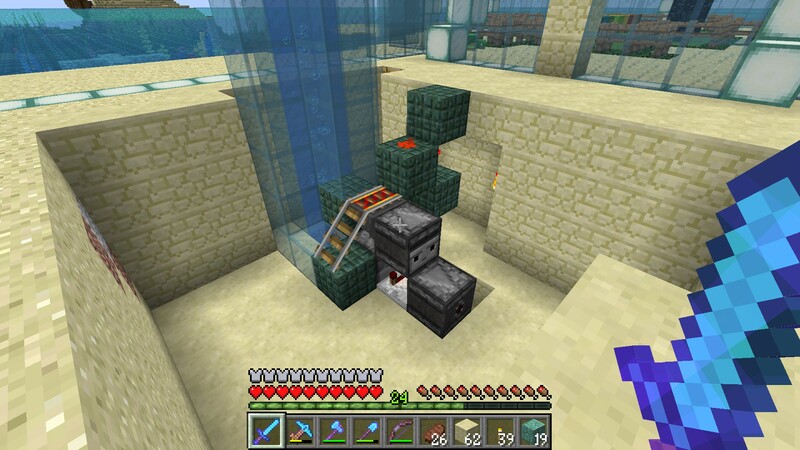 Harvesting sea grass from the farm is quick and easy; get in the minecart, aim just below the dividing line between the sea lanterns and the prismarine floor, and hold the left mouse button. Standard shears last about 20 seconds before they break, in which time, somewhere between three and a half and four stacks of sea grass will be harvested and appear in the chest. In the test world I'd planned to use Silk Touch enchanted shears to harvest both sea grass and coral at the same time - but I was reminded, on returning to this world, that shears don't accept Silk Touch any more, and those I already had couldn't be combined with Unbreaking III or Mending. So I harvested as much sea grass as I needed with Advanced Lawnmower Simulator (Unbreaking III & Mending) which I could repair quickly by killing a load more skeletons, thus obtaining more bones for the farm. To harvest coral instead, I already had Starquake with me (the Silk Touch spade), and as it doesn't take any damage when harvesting coral, I could reconfigure the controls to substitute another key for the left mouse button, weigh it down and leave the farm AFK for about 40 minutes before the chest and hoppers behind it were in danger of backing up so that some was wasted. 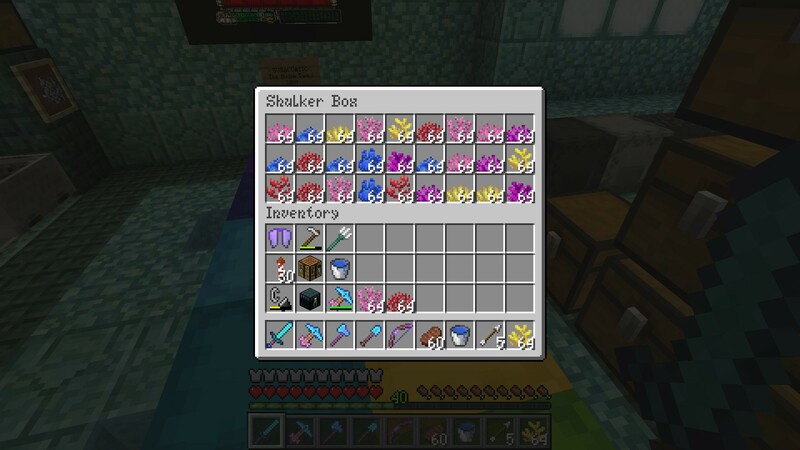 In the end I managed to fill ten shulker boxes with coral - which should, on average, mean a full chest of each variety. Coral fans are found in greater abundance than coral "heads" (as we might call them) in the wild; this farm produces both types equally. With a bit of luck, one day, coral blocks will be craftable, and hence renewable. If they're crafted from the coral I can grow in this farm, as I'd assume they would be, then I'll have this stash all ready to go, and this facility to make much more - even if it takes a while. Here's the final scene outside - the turtle dome, the hatchery, the conduits, and the pipe that leads into stormfrenzy's underground farms.